Utopia Contemporary Art - CAMPAGNA - RASSEGNA DELL’ACQUA - 'A CHIENA (Chiena Art Festival): REVIEW OF THE WATER - the "CHIENA"
Remembering the names of two of the artists who more than the others, made of the water an important moment of their young creativity. 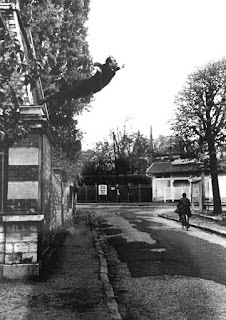 First, Yves Klein, in Paris, throwing the own thoughts in the waters of Senna, the ontological search, between the informal, the action painting, and the first behavioural actions (together with Piero Manzoni) that went beyond the great season of the informal, in that end of years 50 and beginning of years 60, anticipating, between the others, the POP Art American and the Poor Art. The second, Gino De Dominicis, very young , in Rome, with its attempt to form in the waters of Tevere river squares instead of circles, throwing the pebbles, in the search of behavioural capacity to the limits of “provocation”, in that beginning of years 70, after 68, like consequence of one philosophical reflection on the art of vanguard and in making art, “contesting” the “bourgeois and commercial” system of the art, anticipated by far, like an isolated case, some extreme experiences of behavioural art. Both, staring from a “Jarryana” root beyond the DADA and the object found of Duchampiana memory, in which freedom, irony, creativity, provocation and prank, represent the pillars of “patafisica” science, Mail Art and installations, Video art and Performances, through a route without frontiers, on waters, in waters and with waters of the rivers, torrents, streams Fountains, beginning from the epicentre of one of the centres of the plan of CSM (Campaign with its Review of the Water and Chiena), located in different parts of the territory of Salerno-Campania, national and international, with several participations (mail art and installations, actions, performances, happenings, Video Art, documentaries, fictions), with the participation of selected national and foreign artists living and working cities and places crossed by rivers, in cities and small towns where is almost a fountain, asking them to send a video of an action , a performance of any intervention, of a simple reflection, coherently with one one of their peculiar expressive search, to the standard of a‘provocation’and an evocation, around to the more vital element for the life itself on the earth, like the water. One provocation and evocation, to be used like a therapy of collision, with regard to the ‘extremism of the ignorance’, breathed at world-wide level, opposing to this taste of death, the life, the creative freedom, the irony, the sarcasm, the mockery … exactly. Every artist can participate to all the sections, for a free topic, in the world-wide year of the water. For performances and for the installations, for technical reasons, the projects must be sent in advance within the 15/20 June 2007. The projects will be accurately examined by scientific board inside the Association Utopy. The authors of the selected plans, will be hosts for the required time (three/four days, two of which in a 4 stars Hotel, both for the Performances and for the Installations. Three of these plans will be chosen for each one of the two sections. 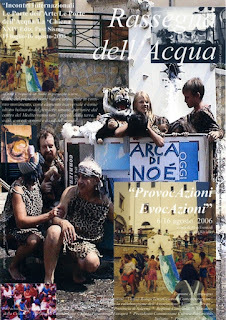 For the other sections (Mail Art and Video), where the presence is not required, and where all the artists who will send a Video or a Mail Art work will be included into the Review, the adhesion must be send within the 15 June, and the Video and Mail Art works within the 30 June 2007. In this Review/Festival, will be present two categories, corresponding to two generations: Young Artists under 35 and Artists over 35. 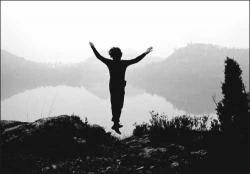 All the participations, divided according to sections and categories will be included into the web sites in project, both in the CSM Festival and in the water review (with precedents editions, in one chronological history of his), cured by the Spazio Utopia Contemporary Art. a) Mail Art: send work from the classic dimension of a postcard 10X15 to a maximum A4 size in all the possible techniques (painting, photo, collage, bas-relief, writing etc. )on extra rigid support (thin cardboard) within and not over 30 June 2007.
c) Performances: only three performances will be accurately selected and admitted during the Review/Festival. They must be simple, effective and at the same time in line with the Review requirements, which are not demanding particular realization techniques, tied to the raid in the Chiena water. d) Installations: in this case too, only three installations will be accurately selected and admitted during the Review/Festival. They must be simple, effective and at the same time in line with the Review requirements, concerning the employ of poor material and not demanding particular realization techniques. The projects of installation and entries must be presented within the 15 June deadline and the Video and Mail art must be shipped within the 30 June.